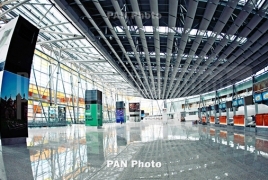 PanARMENIAN.Net - A record number of passengers used the services of Zvartnots International Airport in Yerevan in the month of August, a statement from the company reveals. The airport, in particular, served as many as 329,665 people in the reporting period. Furthermore, a record number of travelers (11,837) were served at Zvartnots on August 1. Passenger traffic in the two Armenian airports grew by 12.3% in January-August 2018 against the same period last year. Overall, more than 1.87 million people used the services of Zvartnots airport in the capital city, Yerevan, and Shirak airport in the northern city of Gyumri.